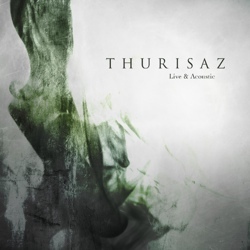 Belgian atmospheric black death metallers Thurisaz and their label Sleaszy Rider Records have set January 24th of 2015 as the release date for their new upcoming CD/DVD entitled “Thurisaz: Live & Acoustic“. Cover artwork and track listing are already revealed. The album was recorded and filmed in front of a live audience and with a choir on the 1st of March 2014 at a sold-out show in ‘GC Forum’ in Wervik, the band’s hometown. Many special guests participated, like Els Blieck on vocals, Inge Van De Wiele and Lore Van Loock on violin and Gudrun Bovyn on cello. The first single “A Natural Disaster (Anathema cover)” is available in the band’s official Youtube page and you can watch it below.